How To Make Rental Agreement in Jaipur, Rajasthan? Hailed as one of the most popular travel destinations in India by both Indians and foreigners alike, the princely state of Rajasthan is said to have more history than the rest of India put together. The capital city Jaipur, fondly called as the Pink City and other cities like Udaipur, Jaisalmer and Ajmer have become some of the popular choices for development. Off late, the state witnessed a boom in the real estate market owing to several development projects coming up there. Rajasthan does house some popular companies and so it is natural that a certain section of educated people flocked to the state in search of opportunities. This, in turn, lead to increased demand for rental homes and in turn, rental agreements. Let’s see how we can make a rental agreement in Jaipur or anywhere else in the state of Rajasthan. Discuss what clauses to include in the rental agreement and draft the document. Print the draft on Stamp paper of state recommended value. Register the document at local Sub-Registrar office. The actual procedure as such does not differ much from that of other states. It begins with the tenant and landlord discussing rent, maintenance charges and what clauses should go into the agreement. This is followed by either party approaching a lawyer to draft the final version of the lease. The lawyer then finds a Stamp vendor and gets the deed printed on Stamp paper of whatever value the State recommends. The parties involved place their signatures on the document, along with that of two witnesses. The deed is then registered at local Sub-Registrar office. 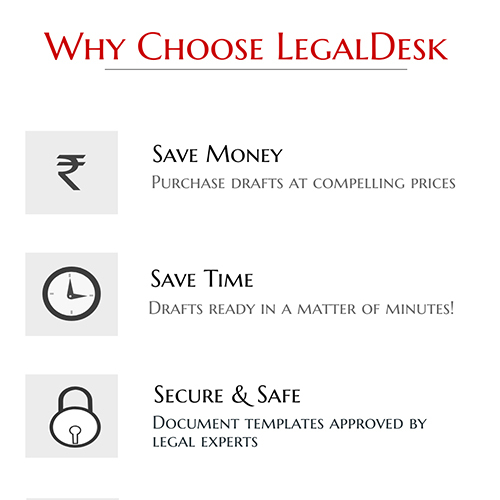 Although this method is widely practised, the cost may vary depending on what the lawyer charges. Then there is also the question of the lawyer’s skill. To prevent such hassles, you can use our pre-drafted rental agreement which is a comprehensive, legal expert verified version of your everyday rental agreement. It is designed to protect parties involved against common loopholes and what’s more, you can create it from the comforts of your home! Stamp Duty is a kind of tax that is levied for making any document legally valid. If the proper Stamp Duty is not paid, the penalty may be a fine of up to ten times the actual Stamp Duty. The Stamp Duty charges in Rajasthan is charged at 5% of the consideration for leases with a duration less than 20 years. Rajasthan announced the issuing of stamp papers as early as 2011. Since then, many centers across popular cities have come up to issue e-Stamp papers to the common folk. Although e-Stamp papers are available, some sections still resort to conventional Stamp papers, especially in the lesser developed cities. Registration is a precaution to prevent frauds and forgeries. If a document is properly registered, it means that the entities mentioned in the document are indeed the ones who signed the documents and it also goes on to prove that the document has not been forged. Registering a document about a certain property will disclose details about feuds/ pending cases about it. Registration charges in Rajasthan for rental agreements are charged at 1% of consideration. Rajasthan too uses the most common types of leases used throughout India. 11 Month Rental Agreement: Perhaps one of the most common types of rental agreements, this agreement is used almost always for residential purposes. The term of this contract is 11 months as the name suggests with the option to renew should both parties wish so. Registration and Notarization are often skipped for this agreement. Commercial leases: Commercial leases are signed exclusively for business purposes. It could be between an individual and a business or between business. Either way, such leases do not conform to a standard format as it adapts to the needs of the business in question. Commercial leases are characterised by large lump sums being paid upfront and sometimes high rent charges. As this is much like a business deal, registration and notarization are never overlooked. Long Term Lease: Long term leases are signed for residential purposes typically. As the name suggests, the term of the lease is often longer than a year. This lease may require a lump sum to be paid upfront although the amount is refundable. Rent, security deposit and maintenance charges: Values for each much be separately entered in the contract so that a confusion does not ensue later. Pets: If the landlord dislikes entertaining pets in his premises, he is expected to state that in the contract. If such a clause is not included, you cannot do anything if the tenant starts housing pets. Late payment penalty: It is ok for the landlord to charge a penalty of his choice should the tenant delay rent payments. Nature of such a penalty has to be described clearly in the rental agreement. Consequences of breach: If either party deviates from the contract or breaches it, the consequences of the same must be spelled out in your lease agreement. Food habits: If the landlord wishes to prevent the consumption of alcohol/ narcotic drugs/ non-vegetarian food etc in his property, it shall be done through the contract. Security deposit or simply called advance is a few months worth of rent collected in advance from the tenant. This is collected as a precaution against incidents like non-payment of rent or damage to the property. If no such incident occurs, the landlord is expected to refund the amount back to the tenant barring valid deductions. Yet another amount collected from the tenant, this time with the intention of blocking the property of the tenant. Once the landlord collects the token advance, the property is considered booked for the tenant. The landlord must then take the house off the market to discourage potential tenants from developing an interest. The amount is generally not refundable and either party backs out after the token advance is paid, he/she will have to compensate for the losses incurred by the other party. Proof of ownership: Always request the person claiming to be the owner to present proof for it. Utility bills, title of ownership etc are good enough. Payment receipts: Never forget to ask your landlord for receipts of rent payment or any other payment you make. Registration of the rental agreement: This is a step that should never be overlooked. If one party is lax about it, it is the other party’s job to take an initiative to get the deed registered.